FIFA this evening officially announced the names of the ten players in the running for the adidas Golden Ball, which is awarded to the competition’s most outstanding performer. In providing Lionel Messi with the best possible support, Di Maria has led the Albiceleste attack with distinction, posing a constant menace to opposing defences with his long-range shooting, mazy dribbling and finishing skills, which he showcased with a well-taken winner against Switzerland in the Round of 16. The Borussia Dortmund centre-half has attracted much praise for his solid displays at the heart of the German defence. As if that were not enough, Hummels has also impressed at the other end of the pitch, rising high to score against Portugal in the group phase and head home the winner against France in the quarter-finals. Kroos ran the show as Die Mannschaft swept aside hosts Brazil 7-1 in the semi-finals, dominating the midfield and posing a constant threat with his passing and shooting, which brought him two goals – all in a day’s work for this most consistent of performers. The Germany captain began the tournament in midfield before seamlessly making the switch to the right-back slot, without it undermining his performance levels or his considerable influence on Joachim Low’s side. Though their much-vaunted attack attracts most of the headlines, Argentina have also been solid in defence, a large part of the credit for which must go to Mascherano for his tireless work in providing the Albiceleste rearguard with essential protection. Messi had never scored at the world finals prior to Brazil 2014, a record he emphatically set straight with some lethal finishing in each of Argentina’s three group matches. Though yet to find the back of the net in the knockout rounds, he has remained an influential figure for his side. In opening his campaign with a hat-trick against Portugal, Muller picked up where he left off at South Africa 2010, where he collected the adidas Golden Boot. His performances since have underlined his status as the spearhead of Germany’s deadly front line. Though only 22, the livewire forward ably shouldered the huge responsibility of leading A Seleção. Neymar was his side’s stand-out performer with four goals before an unfortunate injury ended his tournament in the quarter-finals. The flying Dutch wide man has been in peerless form since putting defending champions Spain to the sword in his side’s opening match. His incisive runs from deep have been a feature of the tournament. Recognised as a huge talent heading into the competition, the gifted Rodriguez has since proved his ability to rise to the big occasion. His haul of six goals in five outings was a major reason why Los Cafeteros broke new ground in reaching the last eight for the first time. 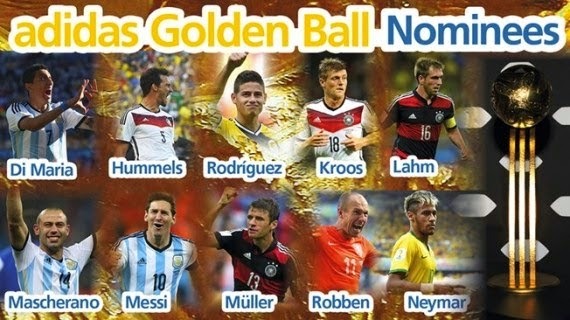 The winners of the adidas Golden Ball, Silver Ball and Bronze Ball will all be announced after Sunday’s Final. Headed by Jean-Paul Brigger, the FIFA Technical Study Group assesses the football played in each of the 64 matches at the 2014 FIFA World Cup Brazil™. Its members are Gerard Houllier (France), Raul Arias (Mexico), Gabriel Calderon (Argentina), Ricki Herbert (New Zealand), Abdel M. Hussein (Sudan), Ka Ming Kwok (Hong Kong), Ioan Lupescu (Romania), Gines Melendez Sotos (Spain), Tsuneyasu Miyamoto (Japan), Sunday Oliseh (Nigeria), Mixu Paatelainen (Finland), Jaime Rodriguez (El Salvador) and Theodore Whitmore (Jamaica). So sorry,no Howard,Ochua,Navas,Ospinas and our very own, Enyeama.They really showed some steel but too bad none was nominated.